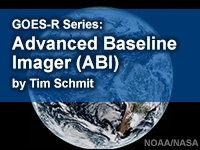 In this webinar recording, Tim Schmit demonstrates the improved temporal, spatial, spectral and calibration attributes of the Advanced Baseline Imager (ABI) on the GOES-R series. The main uses for each of the sixteen spectral bands will be covered, using examples from the recently launched GOES-16 ABI. Imagery and data loops for various types of atmospheric phenomena will be presented to illustrate the improved spectral capabilities and higher temporal and spatial resolution of the ABI. This is a recorded webinar presented by an instructor at his home institution. Audio variations may exist. I lack the spectral knowledge to make this presentation more beneficial, but in coming time, I will have the knowledge to make the imagery products more useful to me, and hence, the material in this module. this was a tough quiz to take but i got it and passed..
Great overview of the Advanced Baseline Imager! This lesson gives a good (and brief) introduction to the fundamental imagery provided by the new GOES-R satellites at a level that is accessible to beginners. Very good for understanding the basic elements of the new satellite. This is an overview course that hits on the important aspects of GOES-16's ABI and compares it to previous generation. Dr. Tim Schmit is not the most dynamic speaker, but he is very proficient for this lesson. Would be nice if touch on how to access the various bands and ABI products through the websites, just a quick but deeper overview. Good summary for those new to the GOES R series.